From Docurama.com: "This Award-winning explosive film reopens the case of America's most "celebrated" death row inmate, exposing a broken justice system that has confined Mumia Abu-Jamal to prison for over 25 years. 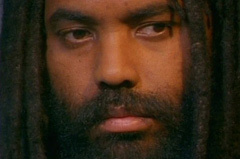 Mumia Abu-Jamal, now 54-years-old, was a journalist, Black Panther activist, and cab driver prior to his arrest for the murder of Philadelphia police officer Daniel Faulkner. His case has received international attention and supporters have rallied behind him in their persistent quest for justice. The documentary pieces together various accounts from the night of the murder (December 9, 1981) and uses testimony from the prosecutor in the 1982 trial, Joseph McGill, and his defense counsel, Anthony E. Jackson. Edginton’s film spends time with many of the witnesses, too, and reveals a pattern of police coercion, especially in the case of Veronica Jones and Cynthia White. As years have passed and Mumia remains in prison, innumerable pieces of evidence have come forward in the case to shed light on what may have actually happened on that night. The 1982 trial is generally seen by supporters to be steeped in police corruption and it’s hard to argue that point after seeing Edginton’s film." "This film is a powerful statement about the state of democracy in North America today"
"Biting, yet poetic, this powerful film blows gaping holes in the credibility of the case against Mumia while giving the man himself room to air his provocative political and social views."